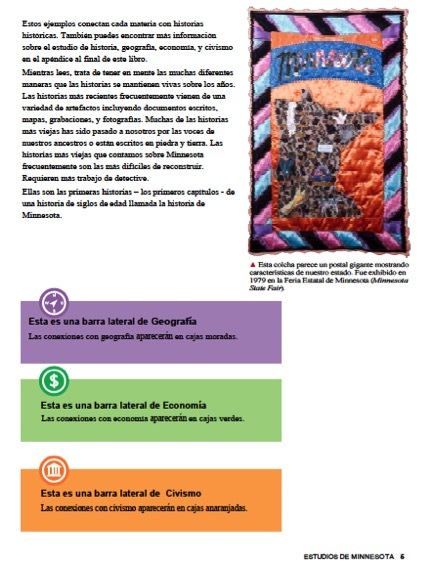 Saint Paul Public Schools has partnered with the Minnesota History Center to create a Spanish and French version of the 6th grade Northern Lights textbook for Minnesota Spanish and French Immersion programs, as well as for Spanish-speaking students in mainstream classes. SPPS is pleased to be able to offer either version (Spanish or French) to other districts to be used in language immersion programs/Minnesota Studies classes, or in support of those classes. The offer includes the complete 20 chapter text in pdf format on a CD with accompanying worksheets. SPPS educators created classroom texts by copying the pages and placing the pages in plastic sleeves in three ring binders for student use. The text will require another round or two of editing to eliminate all typos and errors, but SPPS is confident that dual language educators will be pleased with the quality of the translation and the presentation of the text. The translation follows the paging of the original text and includes all of the photos, graphs and charts of the Northern Lights textbook. It has proved to be of immense value to students and teachers in SPPS immersion classes, providing rich, contextualized language and concepts in the target language. In order to help cover the costs of this immense translation project, SPPS is asking for a contribution of $5000. The cost of the translation was far greater. SPPS's goal is only to recoup some of that expense. Interested districts will be able to make copies for students in their districts; the pdf will have a watermark to that effect, in order to protect the copyright of the Minnesota Historical Society and respect the contract of Saint Paul Public Schools with the Minnesota Historical Society. A district's legal representative will need to sign a contract agreeing to the terms of the contract under which SPPS is working, which would be extended to the new district as well. If you would like the CD, please send the "District agreement to abide by terms" completed and signed by a legal representative of your district to verify your agreement to the conditions of the contract between St. Paul Public Schools and the Minnesota Historical Society, attached to SPPS' original contract "Contract for NoLts - other districts". Submit this documentation with a Purchase Order or check, written out to St. Paul Public Schools, to: Natalia Vang, MLL Office - St. Paul Public Schools, 360 Colborne Street, St. Paul, MN 55102. 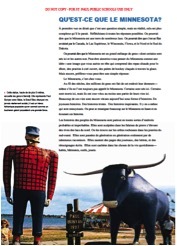 NOTE: Districts or schools must adopt the Northern Lights curriculum and purchase the text in English before SPPS can share the Spanish or French version.